Cruising Attitude has landed – in Germany! The best thing about a foreign sale: different book cover artwork! Here’s what Cruising Attitude: Tales of Crashpads, Crew Drama and Crazy Passengers at 35,000 Feet looks like in Germany. “Really?” I asked The Twitter Translator, because certainly that couldn’t be right. His response: Absolutely. I’m not kidding. Bizarre. Bizarre is right! Never – I repeat, NEVER! – forget your cruising ATTitude. Two T’s. Altitude is another story. We’re not going there today. When I first started learning about the book business I was shocked to discover the publishing house has total control over what the cover looks like, which is why I was thrilled when I saw mine for the first time. Dark (not too feminine) colors. Didn’t want to run off any potential male readers. Slight smile instead of what I imagined would be a big, cheesy, over the top, Stepford Wives at 35,000 feet kind of smile. Reality, people. Non-regulation oversized hoop earrings. Flight attendants are rule breakers, too, ya know. Bright red scarf, the perfect pop of color. Screams FLIGHT ATTENDANT clear across the bookstore. These things matter. They really do. At least when it comes to selling books they do. Yesterday I received a very nice email from a soon to be Lufthansa flight attendant named Yasmin-Marie. 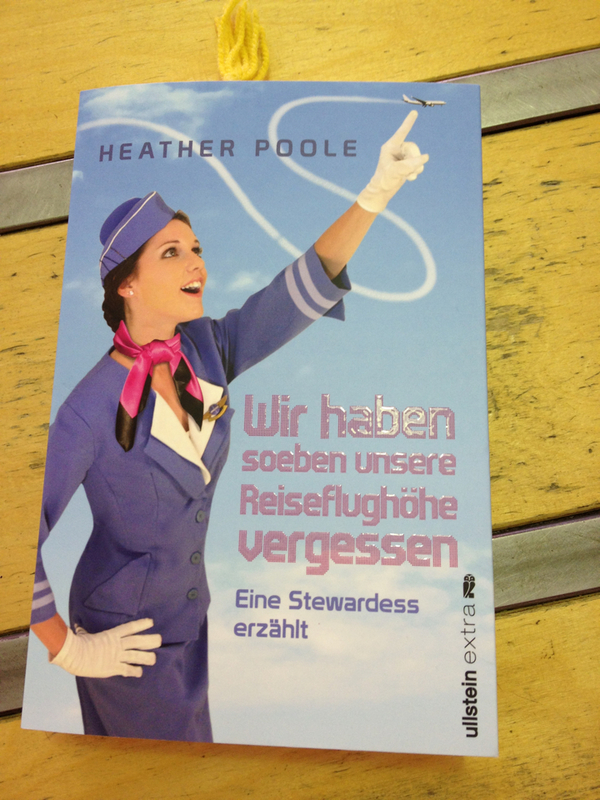 She wanted to let me know she’s reading my book, “A flight attendant tells…” in German. I asked her to email a photograph of the cover. Two seconds later the photographs posted here arrived. I was thrilled. Seriously, how cute is this?! And so totally different from the US version. I love it. Good job, Germany! 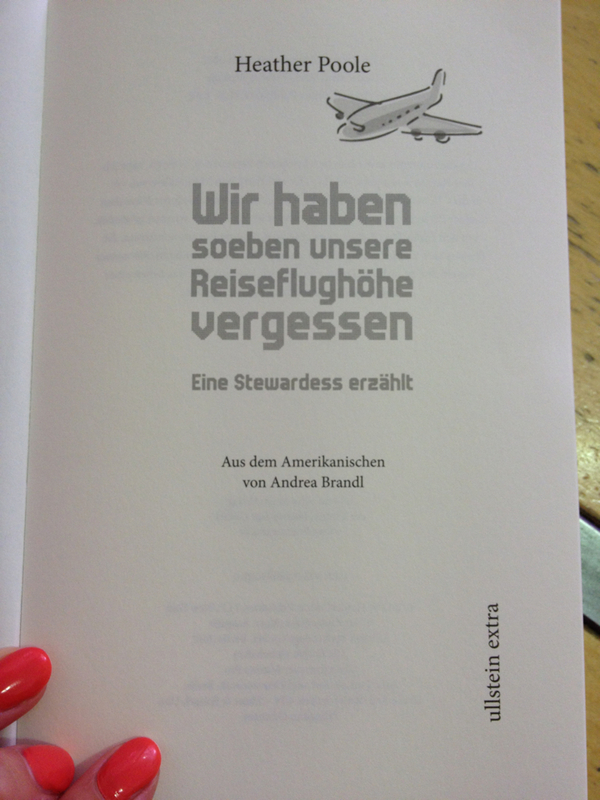 The title is definitely komisch (strange!) but the German titles of EVERYTHING are always whacky. Congrats anyway!! You’ve made it in Germany too! Congratulations! I really love to hear about a successful woman writer! The German cover is nice, but honestly, I prefer the American cover, which makes exactly very American ! And I love it ! Have you a word to say so that your book goes out in a country ? I would like a translation in France !! 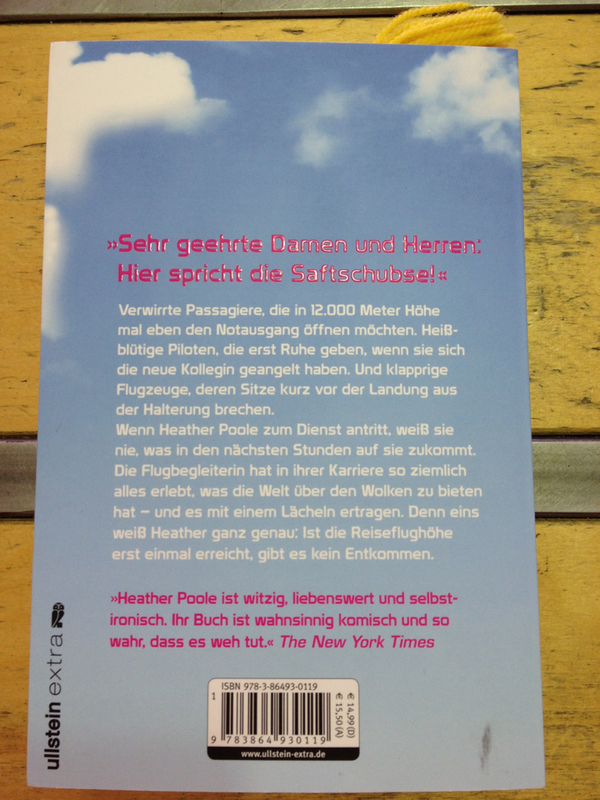 The German cover appeals to my girlish side, but I like the US cover better, too. I’m glad I have both.